About a month ago, I was telling Anders of Gnomon that watch companies seem to be headed down memory lane of late. Rado with the D-Star, Rolex with the orange hand Ex2, JLC with the Rendezvous, Tudor with the Black Bay to name a few. He smiled and tickled me with a teaser. He said told me to hold off my purchases for now as he would be launching a couple of value for money offerings from Squale very soon. I waited impatiently, bugging him for preview pics but he just wouldn't relent. Then came the fateful day. I tried it, thought it's a tad too small for me and decided to pass. But I couldn't stop thinking about it for the next 2 days and told Anders I'll take the last piece that he had. Thank God as there were only 20 or 30 pieces produced. And since, then, I've had 2 offers from two brothers in WUS. But as My wife has expressed interest in it as well, I declined their offers. Furthermore, I do not have a habit of selling my pieces. Anyway, let's take a close look at the watch now. This watch bears a close resemblance to the Rollie that it pays homage to. The case is very well finished. All the right curves and lines. the 40mm case diameter is identical to Rolex Sub it's pay homage to. This variant is fitted with a NOS (new old stock) gilt dial with gilt Mercedes hands to match. the text just above the 6 o'clock index is another tasteful design feature. They have also added the correct magnifier to the cyclops date window. It's perfectly magnified. The uni-directional bezel makes a full rotation in 120 clicks. It's firm and steady and has hardly any free play. Very reassuring. It also has a relatively slim profile which makes it a snitch when in shirtsleeves. Another pleasantly unusual feature that amazed me was the crown. unlike most watches, the threads are on the inside of the crown. You can't see any threads on the stem housing. Also, it takes about 8-9 turns to screw and unscrew the crown. Another assurance of it's water resistance? The case back is pretty spartan save for the usual literature, model reference and Squale logo. The twin lock clasp snaps into place easily and holds down firmly and unclips with minimal fuss. True to form as a diver's watch, it even comes with diver's extension. The bracelet is tapered and I don't think it has to be as the case is not that huge. They are well constructed and has hardly any gaps in between. It has a nice solid feel. However, the bracelet that comes with the watch could be rather short for those with larger wrists. Some have complained of insufficient links. I'm more used to watches with a minimum of 42mm diameter but thanks to the bracelet and case construction, it doesn't look or feel too small on my wrist (which is not too hug actually only 6 3/4 inches). 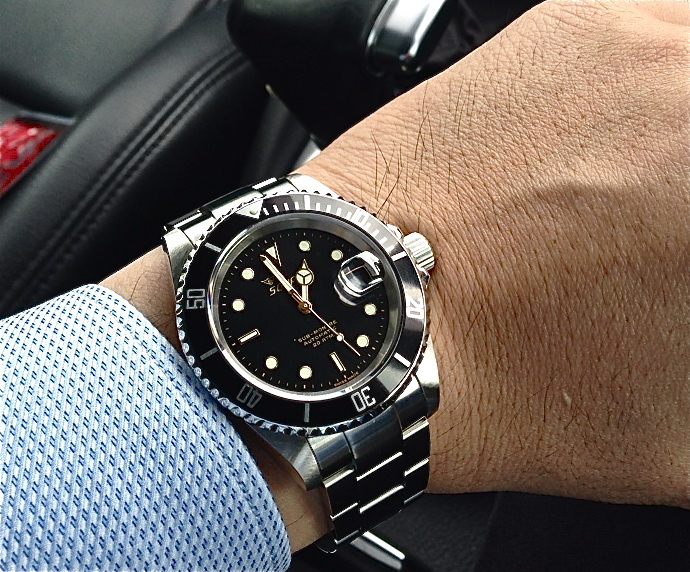 1) The Steinhart is more like an enhancement of the Rolex Sub - big in every way. A modern interpretation of a classic. The date magnifier seems to be pointless, imho. 2) The Squale is truer to form as a homage. Similar size, Cyclops date window that actually servs a purpose. Dial : NOS black dial with gilt indices and hands. - Nice heft for its size. - Versatile - as a work day watch and for the weekends. - Unique screw-down crown design. - Beautifully crafted gilt NOS dial and hands. Value for money?but how much? USD400. But I purchased it locally from Gnomon at SGD500+. i was at gnomon drooling over the maxi but decided to pre-order for the rootbeer 2nd batch instead. Thank you very much. Glad to hear you like the reviews. My apologies for the spelling and grammatical errors and typos. All of them were written in the wee hours of the morning. You will not regret ordering the root beer. It's a no brainer IMHO. When did u drop by? Do say hi if you see me there. Btw, the root beer is the best looking of the 3, followed by the vintage IMHO. But it's subjective. I am very disappointed that the vintage was a limited run. I've been hunting for a sub homage and right when I find the right one, gone. Unfortunately, they could only do the vintage as a limited run cos they only had that many NOS dials. Do check out the sales sections in forums like wus, you might get lucky.